For much of its existence, chamber music was performed in private homes for small gatherings of friends. A recital by the Wasmuth Quartet on January 14 in Oberlin Conservatory’s Stull Recital Hall had the feeling of those earlier soirees, an intimate and cozy evening. The concert was part of Oberlin’s month-long String Quartet Intensive and Festival. Stull is small as performance spaces go, with no raised stage. For the Wasmuth’s concert, standees crowded the back and extra seating surrounded the performers on three sides, putting some audience members nearly within arm’s reach of the musicians. Such a close setting also grants an unusual acoustic: resonance is lost, but every detail cuts through. That exposure could be a nightmare for a performer, but the Wasmuths easily adjusted to the venue. And good thing they did: the sprightly lines of Haydn’s String Quartet Op. 50 No. 6 (“The Frog”) were lithe in their hands, every note clear and bright. 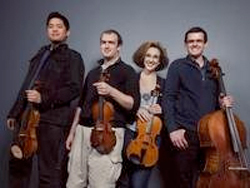 The manic interplay between first violinist Jonathan Ong and second violinist Brendan Shea in the first and last movements was especially notable for a young quartet. Acting as one, the ensemble communicated well in the stop-and-start Minuet. In the second movement, the violinists and cellist Warren Hagerty sketched florid arabesques, delicately shaping phrases and neatly avoiding stodginess. Shea then switched to first violin, and the concert skipped ahead more than two centuries for Dan Visconti’s nostalgic Ramshackle Songs (2009). Written for the Jupiter Quartet, who will later perform the work during this festival, it fuzzes over American folk songs with bursts of squeaking, knocking, sliding, and stomping. Imagine driving along Route 66 in a hiccupping car while listening to an ancient radio that doesn’t quite work and you get a sense of Ramshackle Songs. The quartet swerved between tender melodies sheened by glossy harmonics and raucous fiddle music. A few periods of aimless wandering coupled with the Wasmuth’s penchant for extended rests caused it to feel fragmentary and lengthy. Excitement returned with the vibrant Ravel Quartet in F. The hall’s magnification of individual parts revealed hidden details and enriched the dark tone of violist Abigail Rojansky in her various solos. With Ong back in the first chair, the opening movement was violin-driven and colorful. The Wasmuths achieved an amazing shift in tone in the muted middle section of the second movement, an extreme contrast from the brilliance of its madcap main sections. The contemplative third movement felt a bit stretched out, but was movingly shrouded in shadows by the Wasmuth’s thick sound. The evening ended in a flash of vivacity with the quartet’s energetic romp through the last movement. The Wasmuth quartet is less than a year old, but has already received acclaim in multiple competitions, deservedly so. Their quick adaptation to a unique performance space and ability to play with an audience breathing down their necks on Jan. 14 revealed them as thoughtful, impressive musicians. It will be exciting to see where the future takes them.